Grim news has emerged from Qatar, where preparations for the 2022 World Cup are underway. Even though construction on the stadiums has yet to begin, The Guardian reports that the working environment for Nepalese migrants amounts to slave labor. And it's probably going to get worse. 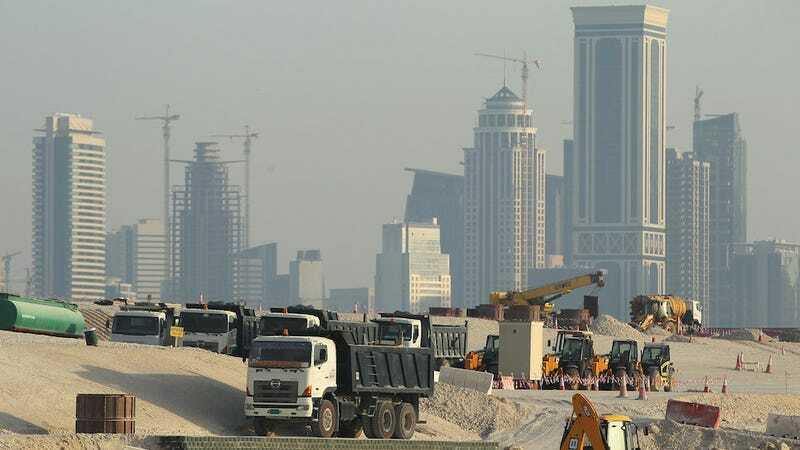 The trouble can be traced to Lusail City development, a $45 billion town being built from scratch that will eventually be home to a 90,000-seat stadium. There, countless Nepalese men have been working in 120-degree heat for days at a time without access to free drinking water and without being paid. Incredibly, it is estimated that one worker per day died during the summer work season. The Guardian investigation also found that the contractor failed to provide workers with ID cards, relegating them to the status of illegal aliens, and forced them to live 12 to a room in conditions so squalid that illness has rapidly spread. The situation is so bad that at least 60 workers have fled to the Nepalese embassy in Qatar in order to escape. The real trouble is that there's really no escape, and with the bulk of the World Cup construction still to come, there's a decent chance we'll hear about more malfeasance. "We'd like to leave, but the company won't let us," one worker told The Guardian. "If we run away, we become illegal and that makes it hard to find another job. The police could catch us at any time and send us back home. We can't get a resident permit if we leave."